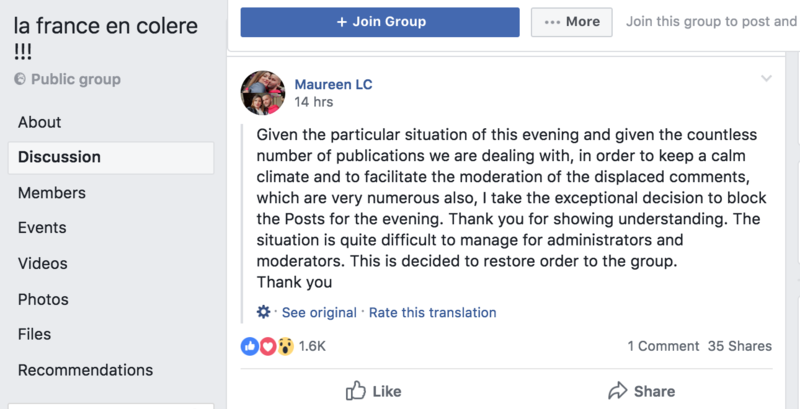 Some of the biggest Yellow Vest groups on Facebook are having to lock down their comment sections as users flood French News Feeds with conspiracy theories about Tuesday night’s attack in Strasbourg, eastern France. At least two people have been killed and several injured after a gunman opened fire at a Christmas market in the city, the seat of the European Parliament. The gunman remains at large, and a massive manhunt is underway in France. The attack is offering a dizzying glimpse at how bad the fake news problem has gotten inside the incredibly viral Yellow Vests Facebook community. The Yellow Vests, or Gilets Jaunes, movement began on Facebook and its supporters communicate almost exclusively within increasingly huge and unwieldy decentralized Facebook groups. They coordinate via memes and viral videos. Whatever gets shared the most becomes part of their platform. The protest movement began in France in early October after a Change.org petition about fuel taxes went viral within a small Parisian suburb. The petition led to a Facebook event, which has now led to four weeks of similar Facebook-led protests spreading across France. Three people have died so far, hundreds more have been injured, and thousands have been arrested. The Yellow Vests movement has no clear leadership nor much of a coherent political ideology beyond a hatred of President Emmanuel Macron and an intense anger over growing inequality in France. It has brought together every kind of conspiracy theorist and internet grifter imaginable: anti-vax, 9/11 truther, anti-Masonic, anti-Zionist, climate change skeptic, green-deal activist, chemtrails, pro-refugee, anti-EU, Illuminati. Also, because it’s being fueled by pure Facebook viral outrage, the Yellow Vest groups have become largely unmoderated fake news swamps. So as news broke last night of a gunman opening fire at a Christmas market, these massively viral groups, which were already extremely polarized and paranoid, went into full-on meltdown. The above post has been machine-translated by Facebook. One of the most prevalent conspiracy theories within the Yellow Vest groups started after a user uploaded a photo of a tweet on their computer screen to a group with around 37,000 members called “France Is Angry.” The post claims that the official Twitter account for the Grand Est and Bas-Rhin region, where Strasbourg is located, warned people to stay away from the Christmas market an hour before the attack took place. What the user didn’t seem to understand — along with the 6,000 other people who shared this post — is that timestamps on tweets are user-specific. If you don’t set-up your timezone properly on Twitter, it can lead to tweets showing the wrong timestamp. There are also a litany of similar conspiracy theories popping up all over Facebook. Many Yellow Vests wrote that they thought it was suspicious that the attack in Strasbourg came only a day after Macron in a state address apologized to the Yellow Vests and promised tax concessions and to raise the minimum wage. Aside from their massive Facebook Groups, the Yellow Vests are also prolific users of Facebook events. Most of their demonstrations are organized across disjointed Facebook event pages, with sometimes several being set up for the same protest in the same city. Every new weekend of Yellow Vest protests is given an “act” number: Act 3, Act 4, etc. The “Act 5” Facebook events this week have discussion sections that are now full of speculation about “state manipulation” and false-flag attacks. Also, as French media has raced to debunk the misinformation hurtling around Facebook, it has caused Yellow Vests to become increasingly distrustful of the press. French broadcaster BFMTV, in particular, has been extremely critical of the Yellow Vests movement and it led to intense moments of real-world violence between protesters and journalists in France on Saturday. A group of Yellow Vests tried to tear their way into a building where BFMTV was filming on the roof. They had spent the morning shouting at the crew for filming and accusing them of spreading fake news about the movement. Protesters finally ripped off the planks of wood protecting the building’s glass doors and smashed through into the lobby before police intervened, firing stun grenades and tear gas directly at the crowd. A screenshot of Maxime Nicolle’s Facebook Live video from Tuesday night. Eight people claim to be official spokespeople for the movement right now, with a growing rogues’ gallery of Yellow Vest influencers and vloggers becoming more powerful as well. 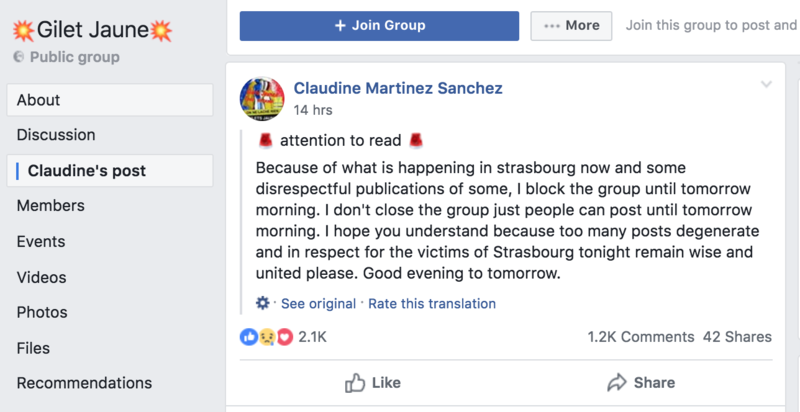 Immediately following the attacks Tuesday night, Maxime Nicolle, also known as “Fly Rider,” one of the Yellow Vests’ most popular spokespeople, went live on Facebook page and talked about how suspicious he thought the Strasbourg shooting was. In his video, Nicolle says that he thinks it’s strange that a terrorist who wants to kill a lot of people would go to a Christmas market at 8 p.m. on a Tuesday when there are only a few people there, and not during a Yellow Vests protest on the Champs-Élysées when there are thousands of people around. Nicolle has a habit of going live, making outrageous conspiratorial statements, and then later backtracking from them. He’s previously hinted that he received secret documents from a government source that could take down Macron’s presidency. The fake news deluge has led several massive Yellow Vest groups like “Gilet Jaune” (Yellow Vest) and “la france en colere!! !” (France is angry!!!) to shut down their comment sections, which in the two months or so since the movement has started had never happened before. For a sense of scale, “Gilet Jaune” has around 150,000 members and “la france en colere!! !” has around 250,000. Locking down comments seems to be slowing down the rate of misinformation, but because Yellow Vests are typically members of several groups at once, some public, some private, it’s almost impossible to know what’s being shared in sometimes equally massive locked-down groups. The Yellow Vest fake news storm has gotten bad enough, though, that on Wednesday morning, Laurent Nuñez, a junior French interior minister, had to issue a statement condemning the conspiracy theories, saying he was indignant at the accusations of state manipulation. It’s unclear how many people will mobilize this weekend for Act 5 protests. Every new weekend of the Yellow Vests movement has brought with it vaguer politics, more extreme violence, a denser storm of fake news, and an increasingly intense reaction from the police.